Vacations are the perfect time to treat yourself! What better way is there than to enjoy an outstanding dinner at the best restaurants in Hawley, PA? Whether you’re looking for succulent seafood, a gourmet farm-to-table experience, an assortment of shared plates, or tasty sandwiches and baked goods, you’ll find the perfect meal less than 10 minutes from Ledges Hotel! Treat yourself to more than just a fantastic meal at the best restaurants in Hawley, PA. Download our Vacation Guide to find the best golf courses, theaters, and shopping districts in the area. Plus, discover our favorite hiking trails, fishing spots, and zip lining courses! For a seasonal menu that uses fresh, healthy ingredients in innovative dishes, stop by The Settlers Inn Restaurant at our sister property. The main dining room features amazing gourmet meals for breakfast and dinner while The Chestnut Tavern serves elevated comfort food. Make sure to try one of the weekly specials at The Chestnut Tavern, like the Burgers & Brew Night or Pig Out Sunday Supper. It comes with pulled pork Carolina sliders, fresh fettuccini and herb sauce, and gouda mashed potatoes. Visit The Dock on Wallenpaupack for delectable seafood, a stunning waterfront view, and live entertainment. This restaurant is located at another one of our sister properties, Silver Birches. It is at the edge of Lake Wallenpaupack and guests can choose to enjoy their meal on the beautiful outdoor deck or the dining room inside. Don’t miss the daily “Lunch Break” in the pub, their version of a happy hour that includes food and drink specials, like $5 pizza on Mondays or $2 steak tacos on Tuesday. Visit Glass-wine. bar. kitchen. for an all-American wine and beer list and a selection of small plates which are perfect for sharing, right here at Ledges Hotel! The menu features classic American and Asian cuisine with a modern twist, like the charred edamame seasoned with chili, garlic, and lime. The braised chicken is also incredible. It’s served with a roasted garlic sauce, sundried tomatoes, spinach, manchego cheese, and creamy polenta. That’s why it’s no surprise that our incredible restaurant won the OpenTable Diner’s Choice award in 2015. It’s open from Wednesday to Sunday, with live entertainment every Friday from 8 to 11 p.m.
Are you looking for scrumptious food that you can take on the go? Visit Cocoon Coffeehouse! From the fresh bread to the delicious selection of sandwiches, soups, salads, and wraps, you’ll get the perfect meal to enjoy while you explore the town! There are plenty of vegetarian options, like the Save Your Life Portabella and Vegetable Wrap, which comes with avocado, hummus, and pesto! If you want to stick to a salad, definitely try the pear, spinach, and goat cheese salad dressed with a balsamic vinaigrette. There are also party platters available if you’re feeding a bigger group. 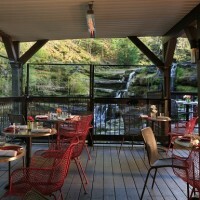 When you’re done treating yourself to a fantastic meal at these restaurants in Hawley, PA, treat yourself to a blissful night of sleep at Ledges Hotel. Our luxurious accommodations are the perfect place to end your day, whether you’re traveling for business, pleasure, or just passing through. For a truly luxurious experience, purchase the Suite Serenity Retreat. Whether you’re looking for the perfect romantic escape or girlfriend getaway, this is a great package. It includes a two-night stay in a deluxe suite or the one- or two-bedroom suite, a couple’s massage, a gift basket, a wine and cheese platter waiting for you upon check in, as well as a full country breakfast at The Settler’s Inn restaurant.